Petermann was selected in the third round, 26th overall, in the 2018 CFL Draft and made an immediate impression by dressing for all 18 games and pulling in 10 passes for 154 yards and one touchdown. 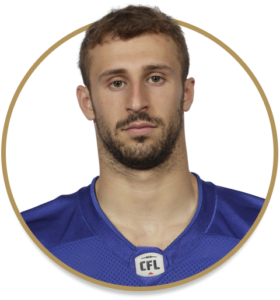 Caught his first career pass in a win over Montreal on June 22nd and his first touchdown in the Banjo Bowl, a game in which he finished with four receptions for 67 yards. Made his first CFL start in Edmonton on September 29th. He spent four seasons with the McMaster Marauders. In 2017, Petermann led the Marauders with 36 catches for 517 yards and two touchdowns. In 2014, Petermann earned the OUA rookie of the year award with 61 catches for 831 yards and nine touchdowns.